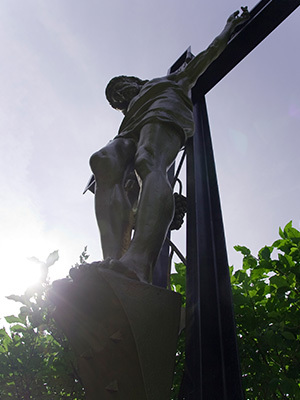 Established in 1954 by Archbishop John Hugh MacDonald, this forty-five acre property serves the population throughout the greater Edmonton area. 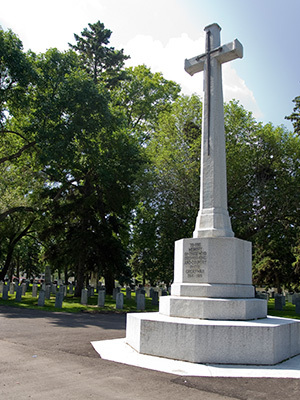 Clergy, including Archbishops John Hugh MacDonald and Anthony Jordan, along with religious brothers and sisters who have served the Archdiocese of Edmonton, are buried together in an area marked by a large granite cross which also serves as a central feature for the cemetery. A beautiful lake, home in the summertime to Canada geese, is the central landscaping feature of Holy Cross Cemetery. Shrines are located in each major section, dedicated to various saints and heroes of the faith. In 1990, an 1100 space Chapel Mausoleum, the first in the Archdiocesan cemetery system, was built at Holy Cross. This facility contains single, end companion, and side companion crypts and numerous areas of niches for the inurnment of cremated remains. The Mausoleum is located in a mature, fully developed cemetery. A beautiful lake, home in the summertime to Canada geese, is the central landscaping feature of Holy Cross Cemetery. Shrines and focal features are located in each major section, dedicated to various saints and aspects of the faith. 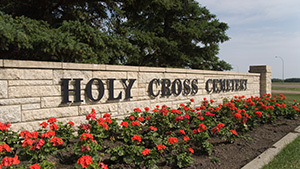 Holy Cross Cemetery permits both bronze and granite flush memorials and has an individual area dedicated for upright monuments. Approximately three acres of the cemetery remain to be developed. Holy Cross Mausoleum is built to stand firm in the face of time; solid rock (granite, marble and tyndal stone) combined with modern design and engineering skills. Skylights and multi-level windows provide natural light. The expanse of windows allows the colors of the sky and cemetery landscaping to become beautiful backdrops in the building. This exceptional assembly of quiet beauty, thoughtful design and durability inspires confidence and a sense of peace in those who bring their loved ones to rest here. Behind the granite or marble crypt cover lies a clean dry chamber constructed of steel and concrete. Each crypt also has its own internal seal, and is designed to provide control over air quality without compromising security. Through dozens of cultures and across thousands of years, families and communities have marked the passing of those they love and respect by preserving their remains and their names in secure and hallowed places. A mausoleum (tomb or sepulchre) provides a setting in which a casket or urn can be lodged in security and dignity. Just as important, a mausoleum provides an environment in which the living may honour the dead in accordance with religious and cultural furniture. 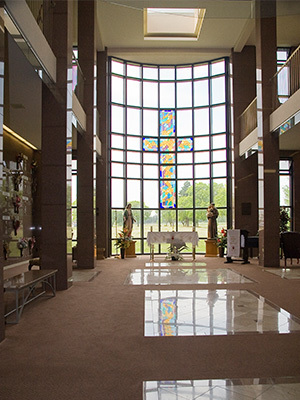 Facilities at Holy Cross Mausoleum provide a sacred repository while offering a unique and appropriate setting for both public and private gatherings and services. Arrangements by request. The Mausoleum contains over 1,500 crypts designed for entombment for full sized caskets; from individual units with space for a single casket and faced with granite, to a dignified Family Chapel with six double crypts in a private chapel which is entirely finished in marble and enclosed with wrought iron gates. Quoted prices will include the cost of the designated crypt, entombment fee, basic inscription and lamp and future maintenance care in perpetuity. 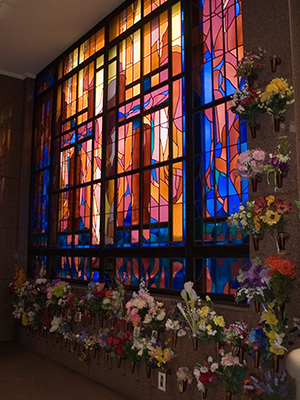 Holy Cross Mausoleum has over 3000 niche spaces for the entombment of cremated remains. These niches have been configured to meet diverse needs; from a single niche with granite front, to a family space with glass front and space for up to four urns. Holy Cross Mausoleum also offers a limited number of special niche locations in the chapel area, private alcove rooms and the newly developed special feature niche area. There are multi-sized and multi-use niches in these areas with closed granite fronts and glass fronts that have one, two or three glass exposures. 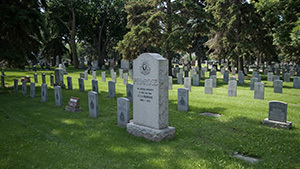 This most recent addition to the Edmonton Catholic Cemeteries was established in 1992 by Archbishop Joseph MacNeil. 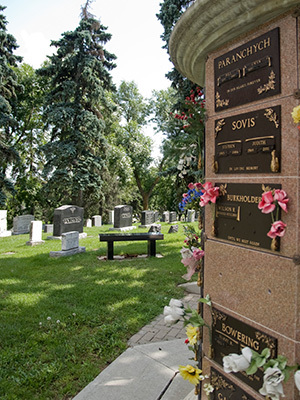 Located in Edmonton's south-eastern corner, at Highway 14 and Whitemud Freeway, this cemetery will, in time, become the largest of the diocesan properties. At present, 18 of a total of 60 acres have been developed. 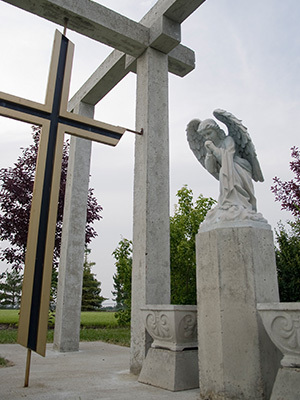 Our Lady of Peace Cemetery features a central lake, shrine areas accented by a statue and other landscaping features and several columbariums for above-ground cremation inurnment. 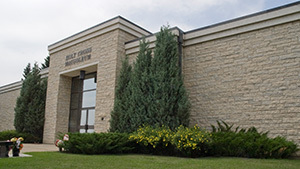 In 2001 a full service funeral home was built on-site by Connelly McKinley, Edmonton's oldest family-operated funeral service to serve the needs of South East Edmonton, Sherwood Park and surrounding areas. 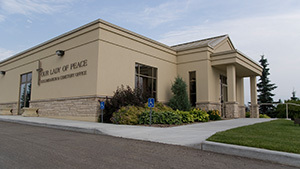 Edmonton Catholic Cemeteries is pleased to announce the opening of its newest niche facility at Our Lady of Peace cemetery. The building is designed to hold cremated remains. It features many different types and sizes of cremation niches to meet the needs of every family. Granite as well as glass fronted niches provide a range of sizes that allow single, double, and family inurnments, all in the comfort and beauty of this serene facility. This attractive setting encourages daily visiting. Extended hours and weekend and holiday visiting are possible through a convenient card access system. 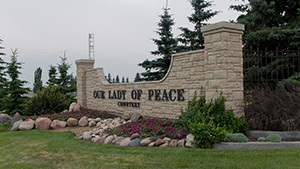 Envisioned as a full service facility to serve the large Catholic population in the Sherwood Park and Millwoods areas, this eighteen acre cemetery currently offers both flush memorial areas and facilities for upright monuments in freedom of choice sections. Its most striking feature is the beautiful lake and fountain and its stone creek beds. At the entrance of the cemetery is a bronze statue of Our Lady of Peace for whom the cemetery is named. Included in the initial development phase is a columbarium for the above-ground inurnment of cremated remains, forming the base of the statue of Our Lady of Peace. In this cemetery there are also facilities for the ground burial of cremated remains and a special section for infant and Veteran burials. There are family garden vaults available for above ground casket interment with surrounding areas dedicated to future family cremation burials. Memorialization in bronze on the granite front and sides of the garden vault is featured. Inside cremation interment in closed granite or glass niches, in all sizes is available in the new Columbarium facility. 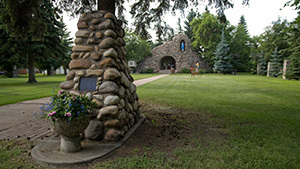 Established in 1860 by Bishop Vital Grandin, the Oblate Fathers supervised the operation of this cemetery until 1975, when it was handed over to the Archdiocese of Edmonton. The Oblate Fathers retained a section of the cemetery for their own burial space. The first recorded burial in the cemetery was 10 year old Marguerite, daughter of Raminakus, on June 1, 1861, presided over by Father Albert Lacombe. Although many were interred in the cemetery during its first thirty years, including over three hundred victims of the 1870-71 smallpox epidemic, there are few memorials which predate 1890. 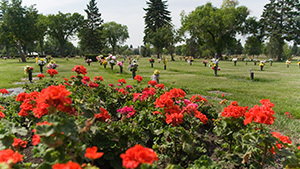 The oldest sections of St. Albert Cemetery have long been sold and hundreds of burials have been made in this four acre facility. Additional space was acquired in 1987 and approximately three hundred additional burial spaces provide both flush memorial and upright monument opportunities. Casket and cremation ground burial, flat or traditional upright memorialization; above-ground columbarium niches for cremation inurnment. 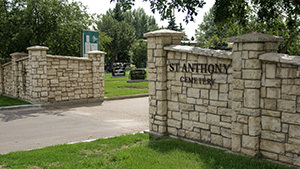 Established in 1902 as a parish cemetery to serve the community of southside Edmonton. This cemetery illustrates the various styles of memorialization, ranging from the older upright monuments (of varying shapes and sizes) to the park-like style of flat or flush ground-level markers. The Duggan family, well-known in Edmonton and prominent in the history of St. Anthony's Parish and in south Edmonton generally, have a family plot here. Because of the size of the property and its age, there is a very limited inventory of available spaces. At this time there are a limited number of flush memorial spaces for full burials and a small inventory of ground cremation spaces. A columbarium has been completed and this structure will accept cremated remains to be enclosed in above-ground niches which are covered in granite. 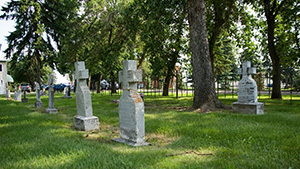 Established in 1888 on land donated by the Groat family, this cemetery initially served the downtown community of St. Joachim Parish, the Catholic parish originally centered in the old Fort Edmonton. 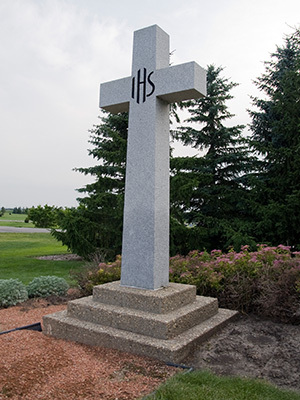 The cemetery contains a variety of historic monuments; walking through its many rows of memorials, one can begin to appreciate the history of the Catholic presence in central Alberta. A large central cross marks the burial crypt of Archbishop Henry Joseph O'Leary (d. 1938). Families who own multiple space lots with unused graves continue to bury their beloved deceased in St. Joachim. Early consultation with the Archdiocesan Cemeteries Office enables families to determine the status of these family plots. St. Joachim established a Field of Honor for veterans who have served their country. The graves are memorialized with flat granite markers as chosen by DVA. There are several areas for the ground inurnment of cremated remains; space is available with flush memorialization privileges in all of these sections. A section of St. Joachim is set aside for infants, there are available spaces in this area. Only flush memorials are permitted in this section..
Casket and cremation ground burial, flat or traditional upright memorialization; Field of Honour for Veterans of Canada's Armed Forces; single depth casket burial and infant ground burial in the children’s area around a central angel shrine. In both pre-need and at-need situations contact our office for an appointment.